Author Joe Nassise, a regular contributor over at the Genreality group blog (along with Carrie Vaughn, Sasha White, Lynn Viehl and others) brought this new innovative project to my attention. 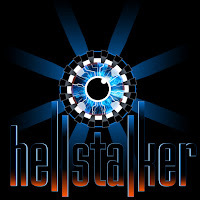 If you are into gadgets and mobile technology over and above ereaders, HELLStalker is a thriller series written by Joe and co-author Jon Merz expressly for the mobile phone market. Here's the blurb - On November 23rd 2009, scientists at CERN in Geneva, Switzerland will run a fifteen second test on the newly completed Large Hadron Collider. For that brief period, protons will swarm back and forth along the seventeen miles of carefully constructed tunnel and slam into each other with devastating force, generating power the likes of which has not been seen since the moment of the Big Bang. Fifteen seconds. That’s all it will take for things to go horribly wrong. Vienna: Blackbetty MobileMedia GmbH, a small screen publisher (SSP) specializing in mobile marketing and distribution, and Vodafone Group Plc, the world’s leading telecommunications company, have partnered with internationally bestselling authors Joe Nassise and Jon F. Merz to produce the first English language thriller series written exclusively for the mobile phone market. HELLstalkers will focus on an international cast of characters and a global setting, with the story featuring quantum portals, a mysterious organization known as the Cerberus Group, and an accident at the Large Hadron Collider in Geneva, Switzerland. The first volume, The Cerberus Protocol, will be released in serial format, with several chapters available free of charge at the Frankfurt Book Fair as a way of introducing the series to its international audience. Like all of the mobilebooks published by Blackbetty, The Cerberus Protocol and its companion volumes will utilize high resolution graphical cover art, easy-to-use navigation, high quality fonts, and interactive features such as a feedback function that allows the reader to contact the editor, the publisher, and even the authors themselves. “I find the idea of interactive storytelling to be particularly compelling,” says Nassise, “and I’m extremely excited to be releasing HELLstalkers to our readership in such cutting-edge fashion.” Co-writer Merz agrees. “I’m thrilled that we get to reach a global audience with this project. 21st century technology means writers like Joe and I have yet another way to get our stories in front of readers.” The series will also be supported through a fully-interactive website where fans can find more information about forthcoming volumes and delve deeper into the mysteries at the heart of the story. Thanks to the partnership with Vodafone, consumers can take advantage of an incredible array of distribution options, from mobile tagging and SMS shortcode ordering to Bluetooth-activated terminals and wireless distribution. The fact that customers can be charged directly by their cellular service provider on their monthly bill makes the entire transaction even easier. In addition to Germany and the US/UK, the series will also shortly be available to readers in Finland, Saudi Arabia, India, and Africa. Joe Nassise (www.josephnassise.com) is the author of fourteen novels including the internationally bestselling Templar Chronicles trilogy. His latest, Eyes to See, will be out from Pan Books in December. As a writing coach, he helps authors make the most of their careers at RockYourWritingCareer.com. Jon F Merz (www.jonfmerz.net) is the author of over a dozen novels, including the critically acclaimed hardboiled Lawson Vampire series, which Merz is currently adapting for television through his production company New Ronin Entertainment. For more information visit the series website at http://www.hellstalkers.com or email info@hellstalkers.com. Neat! I love an interactive story. I'm always trying to listen to songs that are mentioned in books when I can find them. Sounds amazing. Nice blurb, but it's still hard to imagine a novel on the phone. Ladytink I am cellurly challenged so I'll have to wait for a print version but it is neat that they are thinking of innovative ways and technologies. Sheila with my eyes it would have to be a REALLY BIG PHONE!